The upcoming launch of Synths — with support for five currencies and one commodity — is a huge milestone for the project, but alongside this major update there are some other changes being introduced. This post will cover two of these: the launch of Open Minting and modifications to the fee distribution. Minting has been in beta testing since the launch of sUSD in June, over 300 users have tested the platform and the Mintr dApp. We are now comfortable that the minting experience is ready for a wider audience, so with the release of Synths we are opening minting to the public. This means anyone holding SNX (the Synthetix Network Token, formerly HAV) will be able to mint Synths. While the network will support six synthetic assets, Mintr will initially only support minting sUSD. Once sUSD has been minted it can be converted to to the other assets via the ABI interface until Synthetix.exchange is launched in the next few weeks. It will also be possible to use Swappr to convert between different Synths. If the C ratio is exactly in between two levels the lower fee reduction will apply. For example 333% would be a 25% reduction. 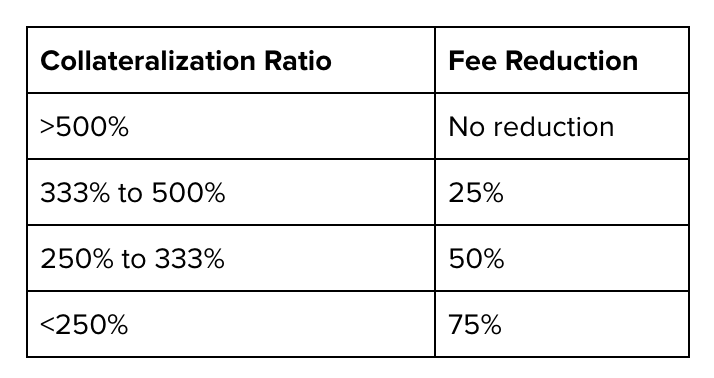 The fee reduction mechanism is designed to incentivise SNX holders to maintain an ideal collateralization ratio of 500%: as the ratio gets lower the reduction in fees increases. This mechanism is more powerful than the one described in the white paper to ensure that as the network scales — when fees are low — that the incentive to maintain the ideal ratio remains as high as possible. This new fee reduction is only applied when an SNX holder withdraws fees, so there is an incentive to improve the ratio before the fee collection period ends and before fees have been collected. The fee period has now been reduced to seven days from the previous 28. This is to ensure that SNX holders regularly check the status of their wallets in the network. Alongside this change, SNX holders will now be able to claim fees from up to six periods in arrears. This is another incentive to ensure that SNX holders reduce their C Ratio before collecting fees —so that even if someone were to wait until the sixth fee period to act, the incentive would continue to increase each week. Open Minting and increased fee incentives are both major improvements to the Synthetix Network and will increase the safety and scalability of the system. Alongside the launch of Synths in five new flavours this release is a huge step forward for Synthetix. As always, if you have any feedback please reach out to us on Discord.